Enjoy the beauty of the sea, you have to go through two trips, at first you will be taken by boat out to sea, then you will transit into a glass vessel waiting. From here you can see the beautiful panorama of natural marine park on the sea floor. If you want to see the beauty of Bunaken marine nature more clearly, you can use the submarine Blue Banter. However, the submarine will only operate at high tides. The view that you can see from the submarine is certainly stunning, as you will directly be under the water surface. Some tourists who go there seem very eager to see the beauty of the marine park is either by boat or submarine glass. In terms of rates, the glass boat is much cheaper than a submarine. 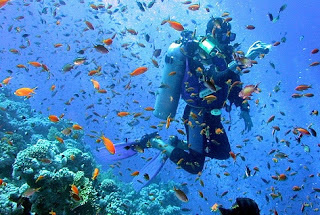 Various activities can be done to enjoy the Bunaken marine tourism, such as diving, underwater photo, underwater video, rental boats and dolphin tour. 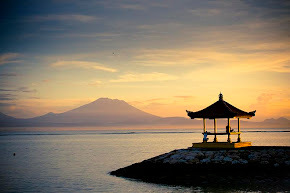 You do not need to worry, because all the equipment to see the charm Bunaken Marine Park is all available there. You can rent diving equipment hire Liang Coast neighborhood. With scuba diving, rescuers can enjoy 'occupants' underwater Bunaken closer, like woodpeckers fish that have dorsal fins that can be enforced and locked so he could live safely in the hole in the rock. Do not approach the nest eggs of fish, because these fish will strike. Gobi fish which is the largest families of reef fish, gobies one unique here is the Gobi shrimp that live together in a sand pit. Both possessed a different task, the shrimp was the nest hygiene-Gobi protects the shrimp from the opponent's attack. There Barracudas are flocking in large numbers with sharp serrated teeth to make it effective predators in the coral. You will see Bertandung, sword fish the Sword and have the same kind of sword at the bottom of the tail. The sword is use to defense of predator attack. Sometimes used to fight with each other to determine who the leader of the group becomes. There is another angel who has a fish nests in the area. This type of fish forms a group consisting of one male and several females. The unique fish is born as females when adult males changed. Uniqueness, these fish are able to make a tap in the water. Perhaps because of its uniqueness was, people call the fish as an angel. In addition to scuba diving, you can enjoy the underwater beauty of Bunaken with snorkeling. You will be happy to vacation in Bunaken. 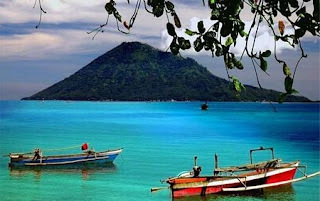 Bunaken people would also welcome with friendly, so you'll be happy here.